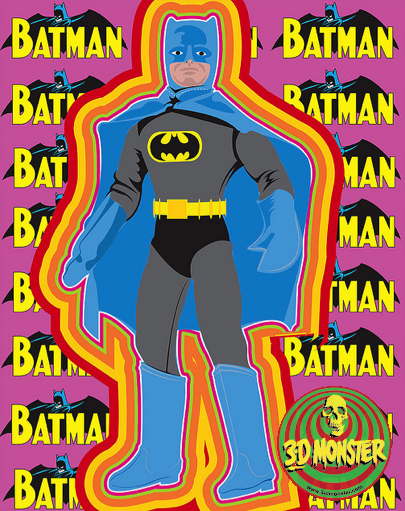 Being Retro: Have you Met... 3D Monster? 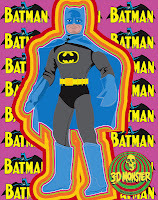 This blog is about anything that I find interesting - Monsters, Robots, toys, movies, art, comics, tiki culture, retro culture, ephemera, 60's & 70's style, music and just about anything that any 14 year-old would like! I think he knows that I am working on a series of vintage Batman stuff, so he beat me to the punch... kidding we have talked a few times and he is one cool cat. I am kidding, I am just happy that there is a talent hidden out there that you all should see and meet. You can find so many hidden treasures and a lot of his art is available in print and shirt form... I found my favorite shirt... I am not afraid to wear pink. I am very jealous of his work, he has a great talent and you can see it in all of his work... did I mention I was jealous. So I ask you "Have you Met... Dan from 3D-Monsters", you should stop over and say "HELLO". Tell Dan that I sent you and all that other good stuff. Wonder if he has a Count Chocula shirt? that's a badass shirt! I love song too! Great song! Jeremy real men wear pink and some men look darn sharp in it. If it makes you feel a bit more manly, it's really more of a light red than a pink ;-) Thanks for the kind words and shout-out, Jeremy; it's been great "talking" to you and diggin' on your blog! To quote King Candy in Wreck-It Ralph, "It's salmon actually."